Time of Origin: Specific planet and time of origin unknown; they claimed to be from Andromeda, but the precise location was never specified, although the time was some centuries after the 30th century. Appearances: "The Ark in Space", "Wirrn Dawn", "Placebo Effect" and "Wirrn Isle"
Doctors: Fourth Doctor, Sixth Doctor and Eighth Doctor. Companions: Sarah Jane Smith, Harry Sullivan, Samantha Jones, Lucie Miller and Flip Jackson. History: One of The Doctor’s more interesting enemies, the Wirrn are a space-dwelling insectoid race, resembling giant dark green wasps in appearance. The most interesting aspect of their biology is that they are capable of recycling waste carbon dioxide back into oxygen, allowing them to survive for prolonged periods in open space while touching down on various planets for food and water only on rare occasions. The most significant detail about the Wirrn is their life cycle, which involves laying their eggs in living hosts, the larvae - a slug-like creature with a size ranging between a few inches to two metres across - subsequently emerging to consume the host and absorb their memories and knowledge, able to infect other organisms and mutate them into Wirrn by means of excreting a green slime to come in contact with them, mutating them into a Wirrn and connecting their consciousness to the hive mind. After humanity drove them away from their original home system at some point in the future, the Wirrn came to Earth almost ten thousand years after it had been devastated by solar flares, the survivors having waited for centuries in suspended animation on board Space Station Nerva ("The Ark in Space"). Although their initial attempt to use the humans as a food source and breeding stock failed when damage they had unintentionally caused to Nerva’s systems caused the stasis chambers to remain online for several millennia longer than had been originally planned, their plan was able to progress when the Fourth Doctor, Sarah Jane Smith and Harry Sullivan arrived on Nerva and reactivated the revivification process. With some of Nerva’s command crew now awakened once again, including senior medical officer Vira and the station’s commander Lazar - nicknamed ‘Noah’ due to Nerva’s ark-like nature -, The Doctor discovered a Wirrn pod in Nerva’s power control room, but Noah’s suspicion of the TARDIS crew’s presence delayed The Doctor long enough for the Wirrn to hatch, its larva infecting Noah and causing him to begin to mutate into a Wirrn himself. With Noah rapidly mutating, The Doctor took command of the situation, instructing Vira and the revived technical crew to keep the rest of Nerva’s population in suspended animation to limit the Wirrn’s potential hosts until he could find a weakness. Using the power source from the transport ship that had taken humans to Nerva to electrify the doors of the sleeper compartments, The Doctor was able to buy time to set up the transport ship to launch with the Wirrn on board, lacking the resources to do anything else after the Wirrn took control of the station’s main controls. However, despite his mutation, Noah appeared to retain enough of his human identity - implied to be the result of The Doctor’s encouragement - to resist his Wirrn instincts in favour of his original humanity at the last minute, leading the Wirrn into Nerva’s transport ship while deliberately neglecting to set the ship’s engine safety protocols so that the ship would explode, his sacrifice ending the Wirrn threat. The Doctor encountered the descendents of Nerva in his sixth incarnation, when he and his companion Philippa 'Flip' Jackson arrived on Earth in the year 16127, learning that Nerva's inhabitants had established Nerva City as their main colony while other groups were breaking off to form smaller habitations in other parts of Earth ("Wirrn Isle"). Learning that Transmat technician Roger Buchanan was living on an island on the frozen Loch Lomond with his family to re-establish a colony that had existed before the loch froze, The Doctor and Flip visited the island by transmat, only to discover that there were Wirrn on the island and the transmat that brought everyone to the island was set to 'receive' only. To obtain help Flip vounteered to use a flimsy micro-light glider to reach a transmat sub-station on the other end of the lake as she was the lightest member of the group and so the only person who could be guaranteed to reach the other side. 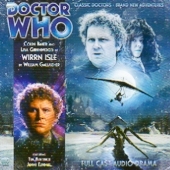 After crashing onto the frozen lake she discovered a mass of Wirrn frozen under the ice, forcing The Doctor to face the awakening Wirrn while Flip was accidentally transported to Nerva City when she reached the sub-station, subsequently finding herself unable to convince anyone in the city to help those trapped on the island. This disbelief in the Wirrn gave the Wirrn the chance to reactivate the transmat and send themselves to Nerva City - aided by the fact that one of them had 'hatched' from Roger's lost son -, with the Wirrn quickly beginning to infect the humans in the densely populated city. However, The Doctor managed to defeat the Wirrn by unfreezing the lake long enough to reactivate the transmat and draw the Wirrn back to the lake, freezing them in the lake once again and trapping them in the ice. 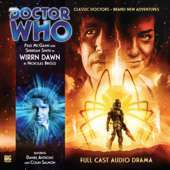 The Doctor next encountered the Wirrn in his eighth incarnation, when he and his current companion Lucie Miller arrived on a spaceship just before the fleet was attacked by a swarm of Wirrn, who were at war with the human survivors who had fled Earth during the solar flares rather than going into suspended animation in the Ark ("Wirrn Dawn"). With the Wirrn easily able to tear the ship’s hulls apart with their bare claws, and the TARDIS having fallen out of the ship as a result of the Wirrn attack, The Doctor and Lucie only just escaping death by grabbing a couple of spacesuits. Although The Doctor felt that the current human/Wirrn conflict was too long and bloody for him to make any kind of impact on it - particularly with most humans convinced that the Wirrn were just a plague of mindless animals -, their ‘rescue’ by an escape pod as they tried to recover the TARDIS forced them to take a more active role as they crash-landed on the nearby planet, The Doctor electrifying the pod’s hull to stop an initial attack by the Wirrn and give them time to salvage supplies from the wreckage. While The Doctor was out helping in the search, he learned that the original settlers on the planet they were on had once sacrificed people to the Wirrn, realising that this sacrifice had actually ensured peace between the settlers and the Wirrn by providing the Wirrn with a human host to serve as their Queen. Since the Wirrn were only as intelligent as the creatures that they were ‘born’ from, Queens hatched from humans were able to live in peace with the colonists, but as random Wirrn Queens began to hatch from the cattle the new colonists brought instead the Queens’ intellects dropped and war became increasingly inevitable. Back in the pod, Lucie faced attack by the Wirrn on two fronts when an injured member of the ship’s crew began to mutate into a Wirrn, but her attempt to defend the new Wirrn from the other remaining crewman earned her the Wirrn’s gratitude, a fact that was particularly useful since the Wirrn in question was a new Queen. Although The Doctor knew that the new colonists would be uncomfortable with continuing the tradition of sacrifice, he also knew that it wasn’t his place to try and interfere with something like that, leaving the new Queen and the surviving crew to convince the Wirrn to leave the planet to the humans while moving on through space to find a new home. The Eighth Doctor faced the Wirrn once again when attempting to attend the wedding of his former companions Stacy and Ssard on Micawber’s World, an artificial planet owned by the Carrington Corporation ("Placebo Effect"), although he faced difficulties even before the Wirrn arrived in the form of his current companion Samantha Jones’ jealousy over the fact that he had travelled with Stacy and Ssard during a three-year period when he left her at a one-hour Greenpeace rally ("Vampire Science") and religious controversy over their mixed-species marriage due to Ssard being an Ice Warrior. Although the wedding went smoothly, the subsequent murder of Bruce Carrington himself and the disappearance of a security patrol investigating the underground tunnels prompted The Doctor to investigate what was going on, discovering that the Wirrn had taken up residence in the tunnels after absorbing Space Security Service xenobiologist Doctor Mason into their hive mind. With the 3999 Olympic Games due to be held on Micawber’s World, Mason had developed a mutagenic drug that would turn those exposed to it into Wirrn, intending for it to be dispersed to the Olympic athletes as alleged performance enhancers. Not only would the drugs turn the athletes into Wirrn, but some of the drugs had a time-delay mechanism added, which would allow the Wirrn to spread over a far broader range rather than them mutating all at once and creating the risk that they could be contained. Despite Mason’s own staff having been infected with Wirrn larvae, The Doctor was able to acquire a sample of the drugs and deduce what was happening in time for the SSS troops to contain the first wave of Wirrn. With the Queen having set up a nest around the planet’s power source, The Doctor was able to electrocute her, sending her larvae back to the Andromeda galaxy in a stolen ship while he provided the mutated athletes with a cure to turn them back to normal.